Previously: Did Huffington Post's incitement and bias contribute to the murders of two NYPD officers? (1) A simple search of actual fliers produced by racists demonstrates that they are about 159 notches down the scale of design ability. (2) All the words were spelled correctly. (3) There was no statement of attribution from the local pointed-white-hat crowd. (4) Austin is the most liberal city in Texas, and one of the most liberal in America. 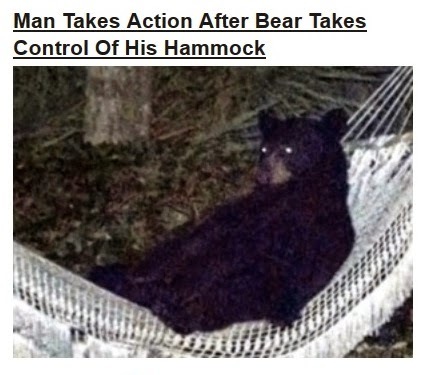 HuffPost kept the story on its front page for three days, through March 21. 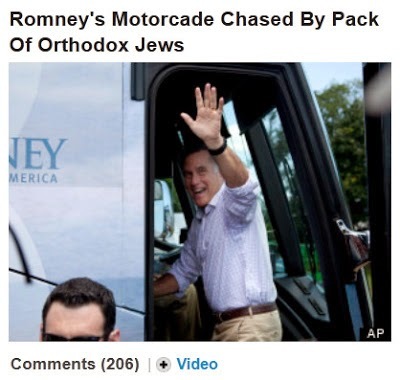 Then, the story mysteriously disappeared from HuffPost's front page. 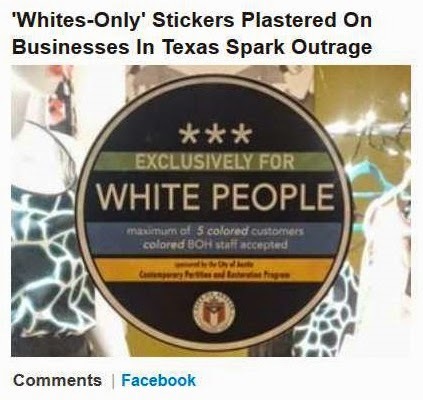 If one relied exclusively on HuffPost for their news, they would have been left to think that the perpetrator/s behind these outrageous stickers had neither been discovered, nor arrested. 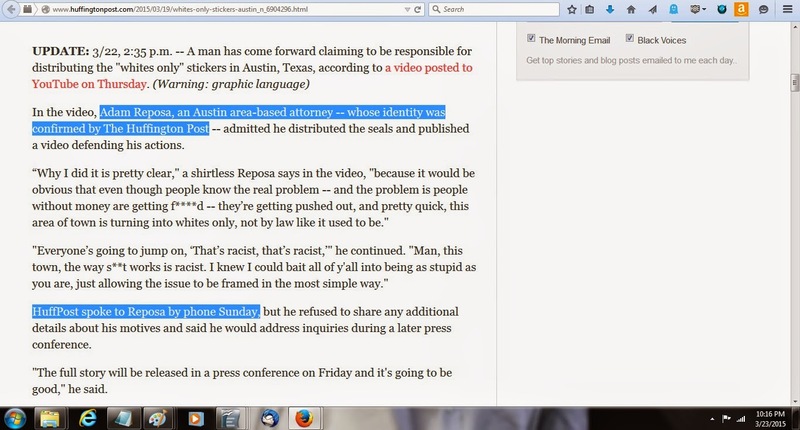 The story of this hoax was soon picked up within a few hours by other (actual) news outlets, including the Austin Chronicle, Raw Story, the New York Daily News, and others. 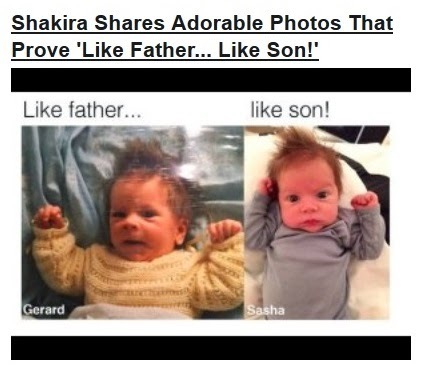 By the following morning, March 21, however, HuffPost still had the original story posted. 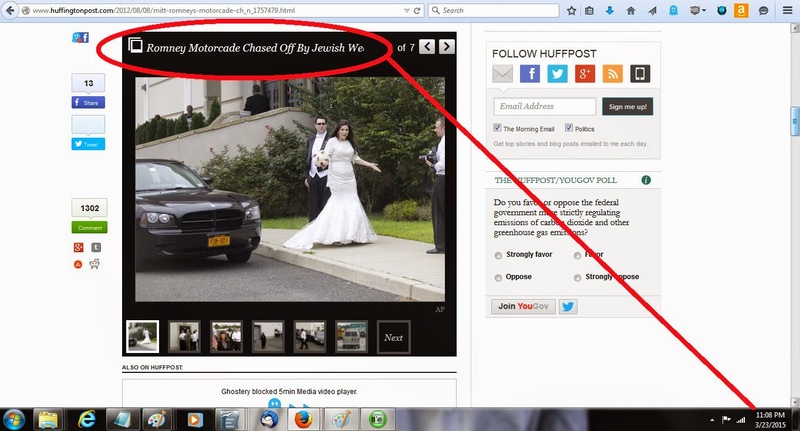 Was HuffPost unaware of the hoax, and who had perpetrated it? No - it spoke to the perpetrator, on March 22. And yet, as of March 23, HuffPost still has posted not a single mention on its front page of anything concerning this story, and the fact that it was a hoax - that it was not, as implied, a racist who was posting these stickers, but rather was a "social activist attorney," who intended to elicit sympathy for black Americans. Rather than being an isolated incident, this is merely the latest example of HuffPost giving top-line coverage to outrageous, incendiary allegations that on the surface reek of suspicion - then deliberately removing the fact that the "news" story had been completely debunked. Note that HuffPost's front page headline said, de facto, that a racist note was left on a Red Lobster receipt - not "apparently," as in the story page. HuffPost gave its trademark sympathetic coverage to the waitress who alleged this was done to her, Toni Christina Jenkins, and who posted it on her Facebook page. 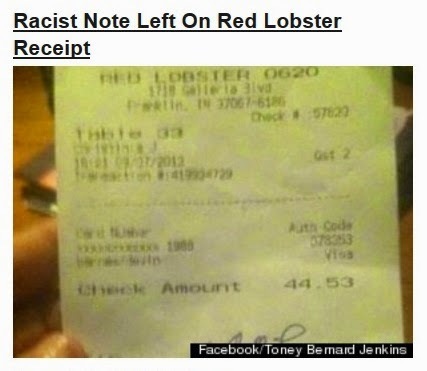 On October 31, 2013, however, it was reported at the Opposing Views blog that the customer whose name appeared on the receipt that the Jenkins posted, Devin Barnes, had filed a $1 million suit against Jenkins and Red Lobster, after a handwriting expert concluded that neither Barnes nor his wife wrote that racist message. HuffPost made no mention of those facts. In fact, it didn't publish the story until six months later, on May 28, 2014 - but not on its front page.